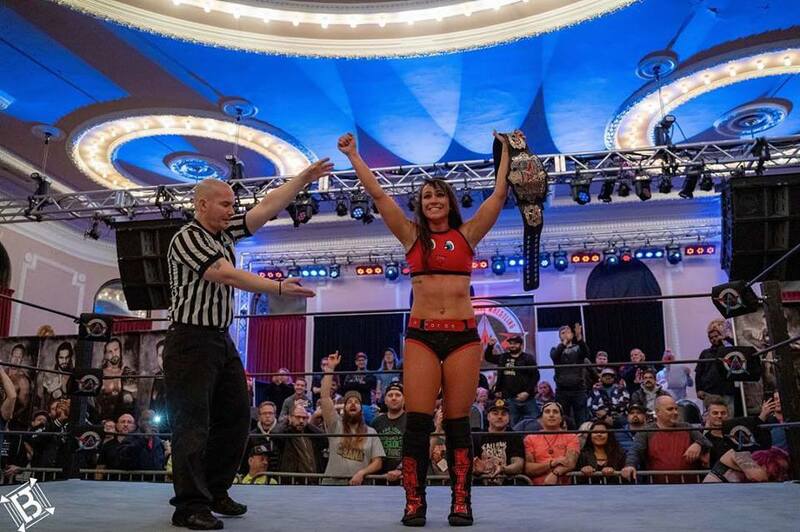 AAW Unstoppable Results (11/24): New Champion Crowned! Once again, AAW Pro invaded Chicago, tearing the roof off of the Logan Square Auditorium and both Mike Killam and Doug Enriquez were there to check out the action. Check out ALL the videos and photos on Twitter @dougEwrestling, @pw_dotcom, & @mikekillam, and the key ones below. It was an emotional show, and we certainly got our money’s worth as the show went record time (more on that below), but the crowd went home VERY happy. The next show is the final show at LaSalle, IL, on December 8th and then it’s followed by the big one, the Windy City Classic on 12/29. To say that this was a hot crowd at the start of the night would be a huge understatement. From the second that we counted down to the last announcement, it was LOUD. And what better way to get a HOT crowd going with Ace Romero. As mentioned, the crowd was hot for Acey Baby throughout, and booing heavily for the Big Bad Wolf, who had turned heel not long ago. Extremely fun match, that had Stephen Wolf playing to the crowd. Eventually Ace was too much for him, and when Wolf went for a springboard moonsault, Ace pounced Wolf nearly out of his shoes to pick up the victory. HARD hitting match with this one, and the crowd was happy to welcome Yehi back. The match spilled into the crowd as Warner threw Yehi into there, but Yehi countered and Warner ended up being the one on the ground in the crowd. Yehi came back and delivered a powerbomb and then turned it into a Koji Clutch and picked up the victory with the submission. The next match had PACO just SQUASH Dion Rusman, a newcomer. PACO wasn’t satisfied with the win, that happened in :58 seconds. PACO gets on the mic and demands that Jimmy Jacobs comes out. Jacobs attacked him last month, and made PACO bleed. PACO says that he had no problem with Jacobs, but after last month, he wants a piece of him. Jacobs comes out, he says he doesn’t have a problem with PACO because he just doesn’t care about him. Goes on to say that he is not going to reduce himself to fighting PACO, but he’s sure there’s someone else out there that would love to fight. Out comes Josh Briggs, who had issues with Jacobs last month when Jacobs tried to recruit him, but instead of attacking Jacobs, he went in the ring to attack PACO! Briggs lays out PACO and Jacobs re-extends his offer, saying that he is the reason guys like Seth Rollins exist, and he can do the same for him. Darby Allin comes out and takes the fight to them both, but he’s laid out by Briggs. HERE COMES JESSICKA HAVOK! Havok has had issues with Jimmy Jacobs over the last few months, and she evens the odds with it seems that we have an impromptu tag match! The main thing to note here is that we need more Darby Allin. I hope that he becomes a regular in 2019 because this kid goes hard, is impressive, and intense. I can’t say enough good things about him. The match was mostly Allin vs Briggs and Havok vs. Jacobs as it went all over the place. Briggs tossed Allin hard into the ring post and then into the crowd. A chair was brought into the match, which allowed Havok to tombstone Jacobs hard onto it. Unfortunately for her, Briggs was there to kick her and set up Jacobs for the Contra Code and pick up the victory. After the match, Jimmy Jacobs extended his hand to embrace Briggs, but Briggs refused and walked to the back.